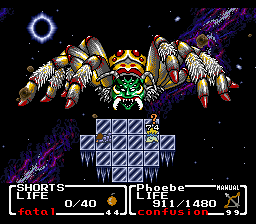 Anyway I feel pretty confident that Phoebe's lack of petrification resist is going to bite you pretty hard here. 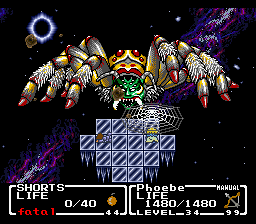 Aw man, I was waiting for the SURPRISE AERO PHOEBE bug to rise to the occasion here. Hum... when we sequence broke the game with the glitched inventory it looked like we messed with sidekick recruitmet a bit. Is it possible to swap out Phobe at this point for someone with less magic we skipped? 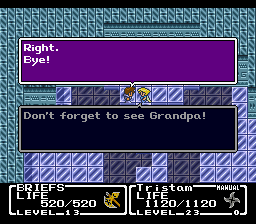 He could recruit earlier Reuben from the Fire Crystal arc, but, uh, that's not an improvement in any shape or form. Reuben doesn't know Cure, sadly, or that would be ingenious. Here it is: the last boss of the game. In any other sort of run, we would cast Cure a couple times and have done with it, but we discovered last time that SHORTS is just barely too weak to pull that off. If you're curious, SHORTS could do it at level 3, and no, I didn't know any of this until I tried it just last time. Dark King resists Blizzard, Quake, Meteor, and Aero. 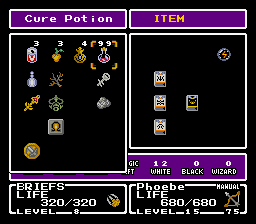 The best attack SHORTS has is therefore Mega Grenade (528 damage), while Phoebe has nothing that rivals White (1916 damage). We have 40,000 HP to chew through. 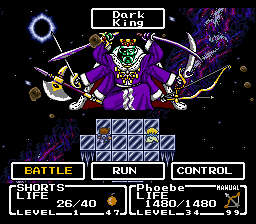 For the first two rounds of combat, Dark King is stuck in his "kindly old man" phase, where he rarely does anything powerful enough to kill even SHORTS. His attacks during this phase do lower stats, but no FFMQ player has ever cared about that, and I'm not about to start. At the end of the second turn, the gloves come off. Please enjoy our listening selection as we fight to close out this game. In his "Gilgamesh" phase, Dark King has a variety of single-target attacks. Several of them are on the weak side, but Dark Saber and Flame Sword are notably strong attacks. Because only one of his moves hits both heroes, it's worth keeping SHORTS around for now. After we deal enough damage to Dark King, he shows his true form. What is the true form of the Dark King? 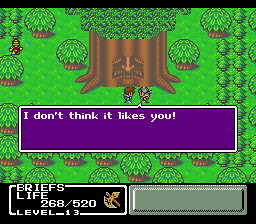 I hope it speaks for itself, because I'm sure not going to speak to that, no matter what Phantasy Star may have taught you. So. We are not very big fans of trueform Dark King. Silver Web: 569 plus Poison and Confusion. Poison ticks for 74, so this is really 663. Golden Web: Theoretically also 569, but it always petrifies. Mega White: 633. 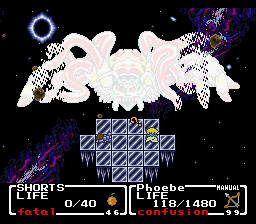 With Phoebe's 1480 health, this is the most damaging attack Phoebe can take twice. Spider Kids: 793. 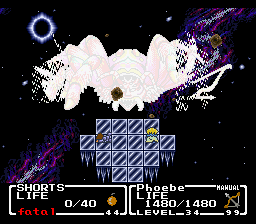 Phoebe can't take two Spider Kids back-to-back, but she can take Spider Kids with Mega White. Lazer: 889. 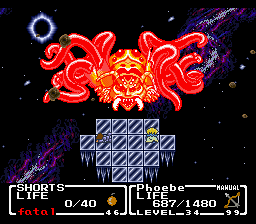 This is strong enough that Phoebe dies with any other attack. Mega Flare: 929. The damage is probably split if it's multicast, but we'd die trying to keep SHORTS alive. SHORTS stays alive. 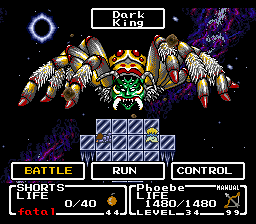 Dark King targets only Phoebe. 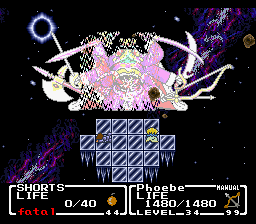 SHORTS keeps Phoebe alive while Phoebe lays on the damage, which means always using Heal if Phoebe ends up getting petrified. Dark King uses only Silver Web or Mega White. He goes last, and Confusion either wears off at the end of the round or happens to do what I want it to. 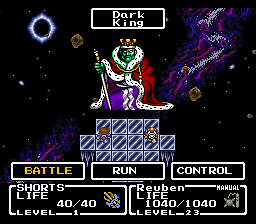 You'll notice that both scenarios rely on Dark King cooperating to an extreme degree and getting pretty lucky on top of that. As much as I hate to say it, this is the end of the line. Short of tool-assisted RNG manipulation, this is just not happening. Short of a victory, this is as an appropriate an ending as we might have hoped for. After all, this could only have happened in a level 1 run. Here's a proof of concept: the fabled 32,336-damage Cure at level 3. 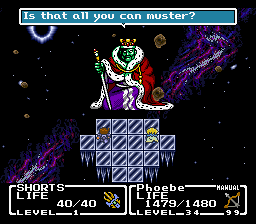 Dark King folds like a napkin against a level 3 SHORTS. The irony here is that level 3 does very little else to help us. 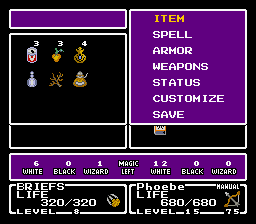 SHORTS has 5 white magic charges and 3 black magic charges, and that's just about it. The tripled health would've made a difference in earlier battles, but it does nothing here. But let's not give up just yet. I said that we couldn't win short of tool-assisted manipulation... so let's do that. Abuse save states as hard as we can and see where that takes us. Backed by the power of time manipulation, all those random elements that were nuisances in the past turn into possibilities. Dark King usually attacks first, but sometimes he doesn't. Dark King usually does something that will kill us in one or two rounds, but sometimes he doesn't. Dark King wins every time... but perhaps there is a chain of events where he doesn't. Dark King is the only boss with phases. I mentioned last time that he has 40,000 HP and that the SNES can't hold a number larger than 32,767. What's probably going on behind the scenes is two separate bosses with ~20,000 apiece. I don't know for sure, although that's how FF5 pulled it off with some of its bosses. In any case, this final transition is the only one that's cosmetic. Tentacle-legs here has the same behavior as tarantula form. I described the basic outline of how this needs to go, but what I didn't account for is that Dark King rarely goes last. In practice, that means Silver Web is off the table, but Spider Kids is usually acceptable. We keep reloading until we don't die: a White here, a Life there, just squeaking out what we can. Eventually, we squeak out enough. So the level 1 run is possible, even if it's not possible in my lifetime. His attacks during this phase do lower stats, but no FFMQ player has ever cared about that, and I'm not about to start. 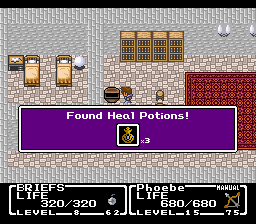 I don't suppose that any of them lower the Magic stat to a potentially useful number? A bug-exploiting run of FFMQ being unable to take advantage of the one bug everyone knows about. The ironing, it is delicious. Thanks for this great LP, Mogri. I'm looking forward to the wrap-up. I considered that! The FF wiki says Spark lowers Magic, but I had him use it over and over, and it only ever affected Attack. If you don't attack old man Dark King, he doesn't transition to arsenal Dark King, so I could've potentially abused that. I will say that the stat-lowering attacks are quite a bit more effective than I would've guessed. I'm not sure whether they stack; if they do, then there's a limit, and it's pretty low. This was great stuff. Stray thoughts from the previous update. 1. "Iflyte?" 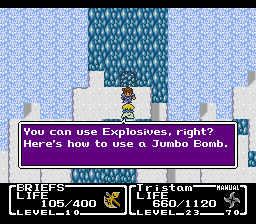 That's maybe the most creative mistransliteration of "Ifreet" that I've seen in a FF game! Underflow Phobe's attack, possibly? Hell we may get lucky and the underflow actually hits her magic stat depending on how memory is arranged. I considered that, too, but there seems to be a limit on the debuffs. Either the debuffs are binary on/off, or this is the one underflow in the game that they bothered protecting against. The fact that we got this far with only minimal save-scumming is a miracle in itself, and I applaud your determination to see it through to the end! Amazing work. Yeah, this was neat-o run from start to finish! And I definitely learned lots more than I was expecting! 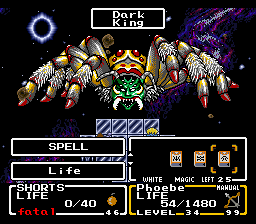 I think the fact that you can legit get to the last boss Dark King like this with clever tactics and bearable amounts of pain, but then the very last enemy is just flat out impossible without RNG manipulation is just as entertaining of an ending as one where he is beatable by rolling the dice for a few hours like some of the other tough bosses. If there's one glitch everyone knows about FFMQ, it's this one. Cast Cure on the Dark King, and he drops dead. 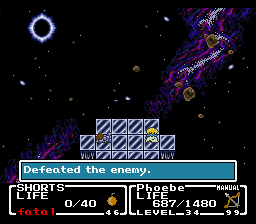 We can keep SHORTS alive if Phoebe uses Defend. 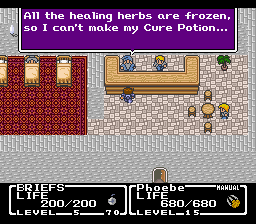 As mentioned way back at the start of the LP, Cure heals for (50 + 1.5 x Magic)% of the target's maximum health. Dark King has 40,000 HP, and with the Dragon Claw equipped, SHORTS has 20 Magic. 80% of 40,000 is 32,000, so that's what we'd expect to see. We could unequip the Dragon Claw and heal for 29,000 instead. 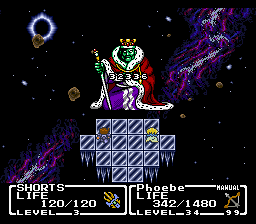 If SHORTS had two more points of Magic, we'd deal the maximum possible damage value, killing Dark King in two rounds. Instead, we can heal him for 80% of his health. What about Phoebe? She has 99 Magic -- pretty impressive! At that value, she restores 199% of Dark King's health in one shot. That's 79,400, which is plenty to overflow -- but it's too much, and it ends up positive again, healing for 13,864. SHORTS is too weak, and Phoebe is too strong, and we've got to kill Dark King legit. This is going to be the moment to remember for the LP. 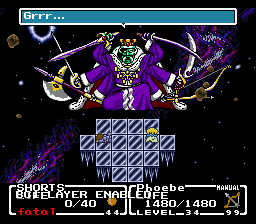 I always kind of enjoyed how FFMQ is a pretty gentle for most of the game and then you meet the final boss and he reveals the whole game was just a joke at your expense and suddenly you have to fight a real enemy and he's legit leagues stronger than anything you've ever fought. The tale of SHORTS has come to an end. Thanks for making this journey with me. I said at the start that I'd played the level 1 run as far as Ice Golem. I'm not so sure my memory is accurate on that count. I certainly didn't do it on console like I claimed, since I don't have a cheat device. What was I thinking? 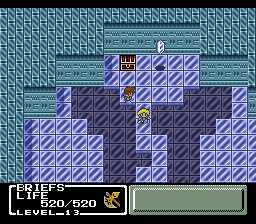 This run consisted largely of blindly stumbling from boss to boss, generating strategies on the fly. I learned a lot in the process. A careful reader might notice me over and over going down one alley and then realizing my approach wouldn't work. That wasn't an act; I really had no idea what I was getting into. The Mummy on the Rope Bridge. I had completely forgotten that there's a forced solo fight so late into the game. I had just finished solo-running the battlefield to pick up Exit, which was fortunate, but not nearly as fortunate as the Mummy knowing a move that wouldn't kill SHORTS. Exit was very useful in that fight, of course, and I finished in about five quick attempts. It was lucky that SHORTS can solo that battlefield at level 1, but even without Exit, Cure would've done it in three shots (and somewhere in the ballpark of 75 attempts, trying to get back-to-back-to-back Poison Flours). Dullahan. 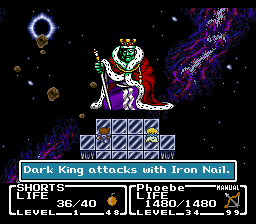 Hardest boss in this run, barring Dark King. My best estimate is I threw myself at him a hundred times or so in order to finally pull off the win. Even then, it's only thanks to Doom Dance's imperfect hit rate that it was possible at all. Pazuzu deserves a spot on this list. This really would have been the end if it weren't for Kaeli's innate Petrify immunity, and I only discovered that in a fit of desperation. With the immunity, the fight wasn't easy, but it was finally possible. Twinhead Wyvern, on the other hand, was easy, but only once I settled into the right strategy. 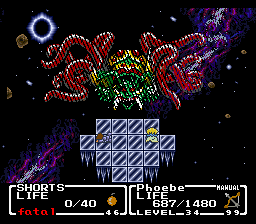 Since it outspeeds Phoebe more often than not, this fight is the only one in the game where you actually need your partner on auto. Having SHORTS carry this fight was a great way to end the game. Of course, Dark King. I had no idea that it was possible for SHORTS to be too weak to beat him the usual way. Several of you mentioned that this was a fantastic twist, and I have to agree: there's no better way that this run could have ended. This is a circumstance that couldn't have arisen in any other run, and the usual Cure win is fun but not exactly thrilling. And, of course, let's give a hand to the lame ducks of the game. Big props to Dualhead Hydra for being skippable thanks to our inventory overflow hijinks. I suspect Dualhead Hydra would have rivaled Dullahan had we fought him with Reuben. Despite being the first major boss of the game, Flamerus Rex wasn't exactly a pushover. Skullrus Rex was. The Dragon Claw doesn't always petrify, and SHORTS doesn't usually survive a round of combat, but in this case, SHORTS's very first attack put Skullrus Rex in the ground. After the heartache that was Pazuzu, I was ready for another tooth-and-nail struggle in the refight. Our first prize goes to Zuh. While Zuh actually has a bit less health than Pazuzu, he also has Doom Dance instead of Stone Beak. Doom Dance was Dullahan's signature attack. 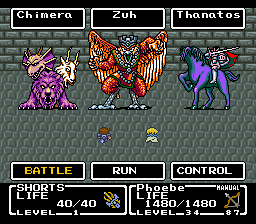 So imagine my surprise when I never actually see Zuh land a Doom Dance. 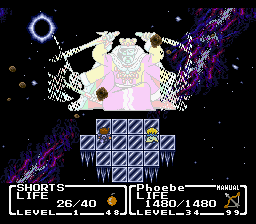 Thanks to the glitchy PsychShield attack, SHORTS survived more attacks from Zuh than from literally any other boss in the game. 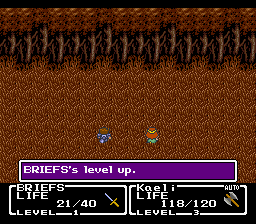 BRIEFS begins his journey like any other. Remember this guy? He wants you to push the boulder out of the way? 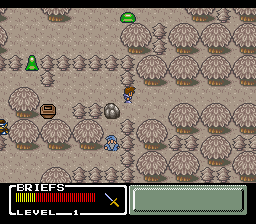 You can instead jump over the boulder and exit back to the world map, but if you do, you don't open up the path to Foresta, and you have to go back into Level Forest and try again. 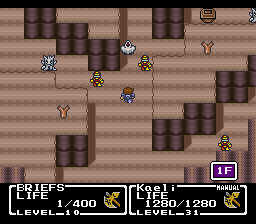 BRIEFS levels up on his third fight. What's that like? I never showed cured Foresta, so here it is. Before you free the Crystal of Earth, everyone wandering the exterior of Foresta has been aged into decrepitude. Now that everything's green, the residents are young again. A vendor. The first consumables vendor is this fellow, who won't sell until you fetch the Wakewater. This requires clearing Wintry Cave (but not anything past that). All four kinds of consumable. The first three are available before Flamerus Rex. 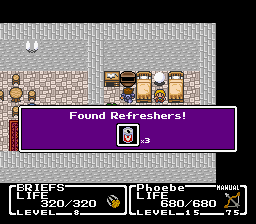 The last, Refreshers, can be found in one of the houses in Aquaria. With our inventory properly arranged, we're ready to experiment. 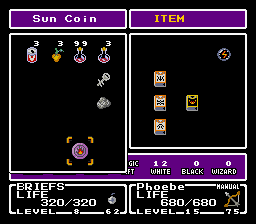 Our key items at this point of the game are the Elixir, Tree Wither, Wakewater, Libra Coin, and Sand Coin. 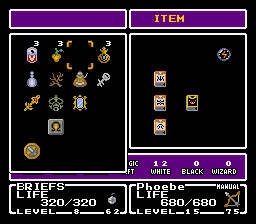 After performing the glitch once, we have the Multi-Key (which lets you into the Mega Grenade house), the Venus Key (unlocks some treasure chests), the Gas Mask (reveals enemies in the Volcano), Magic Mirror (reveals enemies in Ice Pyramid), and Thunder Rock (needed late in the game). None of this is immediately useful. We'd like the key items on the lower rows -- particularly, the Focus Tower coins. We can consume all of our Cure Potions to redo the glitch. Performing the glitch twice more removes the Thunder Rock followed by the Magic Mirror. What happens on the 225th time? Rats. I was really hoping that the overflow would affect the next rows. So let's take another approach. Glitching with Heal Potions to the right of our Cure Potion slot turns the Heal Potions into Cure Potions, and we can dump the Heal Potions from the chest in Phoebe's house into our key items. What's that look like? Looks like a Fire Coin! We would normally find this at the end of the Fireburg chapter -- the one SHORTS skipped. This lets us skip that as well as most of the Aquaria chapter. I have a feeling we'll be in trouble down the line, but we'll burn that bridge when we get there. 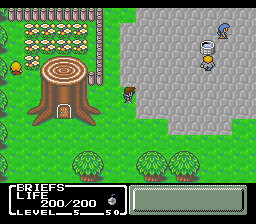 With no useful weapons or tools to his name, BRIEFS's only recourse is to Cure the Rope Bridge Mummy to death. 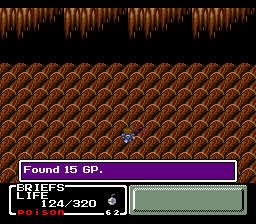 This takes three shots, but BRIEFS is at least strong enough to survive a single hit. We could have done some grinding to make this significantly easier, but with speedup, it doesn't take too long. We skip entirely over the whole second generation of weapons. Our strongest weapon was the Axe, and now it's the Giant's Axe. This is a bit of an upgrade. Remember that Phoebe is normally blocking us from talking to Kaeli. We're meant to talk to Spencer first, who takes off with Tristam. The problem with that is Spencer's Place is still frozen over; we can't go down there. But here's the thing: we broke sequence so bad that Phoebe isn't here for some reason. Without Phoebe in our way, Kaeli joins our party directly, overwriting Tristam. We can make it to the Giant Tree, but without the Dragon Claw, our journey ends here. So let's run the Ice Pyramid with Tristam in tow. Here's some footage you won't see in any other LP! 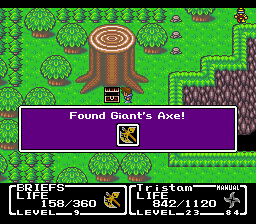 Incidentally, the Giant's Axe is really good at this point in the game. 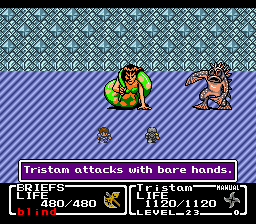 Due to severe mismanagement, Tristam runs out of ammo and is forced to punch dudes. Phoebe can do this, too. 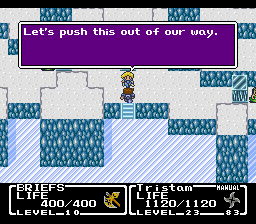 Tristam helps BRIEFS kill Ice Golem, then he dresses like Phoebe and leaves the party. 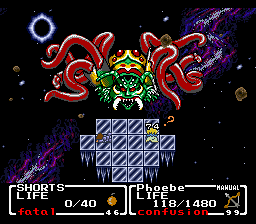 Returning to Aquaria, we find that Phoebe is blocking our way as usual, and all is right with the world once more. We can go to Spencer's and get our Dragon Claw, and the game continues normally from there. Ultimately, we weren't able to skip anything SHORTS didn't, but we did find some new ways to break the game. I hope you enjoyed the journey as much as I did. Let's end with something special. I call this "Reuben Is Out of His Depth." Fascinating LP, Mogri, thanks for doing it. I love LPs that show off things that most people wouldn't see or know about, so thanks for doing this. I actually discovered the resistances bug myself many years ago, and I'd heard of the Cure bug, but the rest was amusingly new. 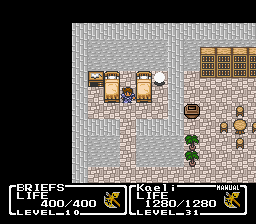 Mystic Quest always intrigued me just for its existence of being a Square game Square would hope get new fans for their games in North America. So thanks for this LP.